Christchurch, 8051, for advice and all the gear you need to catch these strong fighting, great eating, but unusual looking fish. The elephant fish is rather unusual. A large fleshy cartilaginous trunk protrudes from the snout and together with large wing-like pectoral fins combine to give a rather grotesque deformed appearance. The first dorsal fin has a large sharp folding spine. Paul Newbigging caught this solid 6.5kg elephant fish recently while surfcastings at Woodend Beach, near Christchurch. Some anglers are very good at catching elephant fish while others never seem to be able to hook one! The overall colour is silver-grey with brown blotchy markings. This species is closely related to sharks and therefore has no bony skeleton; instead, it has a backbone of gristle. This means that it provides two large boneless fillets which have for a long time been used in the fish and chip trade. Elephant fish is very good eating. The odd appearance of the elephant fish would put-off most buyers should they see it whole in their fish monger’s shop window. For this reason, the fillets are sold with names like silver trumpeter and silver fish. They are excellent eating. The elephant fish is rather unusual species related to sharks. Average size 60 to 90 cm. It has smooth skin which is bright silver with dark blotches when first caught. Will take cut-bait but is best targeted with shellfish and crab baits. The elephant fish is a strong fighter on rod and line. Elephant fish are very strong fighters when hooked even on surfcasting gear. They will often swim strongly back and forth before being landed. Female elephant fish come into the shallow waters of the South Island ‘s east coast between October to November to lay their egg capsules in the sand close to shore. It takes until April for the baby elephant fish to fully develop and emerge from their horny egg case. They do this by escaping down through the narrow passage at one end of the egg capsule that is normally closed off by a special valve. At times large numbers of their discarded egg capsules are eventually washed ashore, particularly at Sumner and New Brighton Beaches. I have found these used egg capsules from Amberley to South Rakaia beaches. They look much like just another piece of washed-up seaweed. In the water, they are a yellowish brown colour but darken to black under the sun much like a thin piece of old dried leather. The egg capsules of the elephant fish are almost pear-shaped: being round at one end and pointed towards the end with, the escape tunnel. Egg capsules of the carpet shark and skate are smaller and square shaped. In the case of the skate, they have tendrils at the corners. From April onwards sometimes very large numbers of elephant fish egg cases are washed up on the beaches between Sumner and the mouth of the Waimakariri River making it most likely that the shallow inshore waters of Pegasus Bay are an important breeding ground for this species. Anglers surfcasting from Canterbury beaches twenty or more years ago were at times able to catch a dozen or more in a day on baited hooks. They are now only caught very occasionally in this way. It is now a good day’s fishing if a single elephant fish is caught in this way. They are powerful swimmers and a large specimen, about 1.2 metres (4 feet long), will put up a spirited fight on rod and reel. From a video I watched on the internet of an elephant fish filmed underwater they appear to get a lot of forward thrust from their large pectoral fins rather than from their whole body in the way a typical shark does. Elephant fish egg capsules are larger than those of the carpet shark and skate. They measure some 250mm x 100mm. Note how the cavity in the capsule resembles the shape of the fully formed fish. At the time of emerging from the capsule, the elephant fish weigh about 300g. Photograph courtesy of Allan Burgess, fishingmag.co.nz, taken along the beach on the south side of the Rangitata River mouth. This photograph was sent to The Museum of New Zealand Te Papa Tongarewa and confirmed as that of an Elephant Fish by the curator of fishes. Elephant fish are bottom feeders and according to biologists, their diet consists almost entirely of shellfish and crustaceans – crabs, and shrimps. They seldom eat fish and when they do only very small ones. Elephant fish don’t often take a hook baited with cut fish fillets. Good baits include pipi, mussel, tuatua and toheroa. Like rig shark elephantfish feed on animals, they find living on or under the seafloor. Crustaceans like crab and lobster are also excellent bait for elephant fish. Both cooked and uncooked shrimps and prawns obtainable from any supermarket are also good baits for this species. I’d go for uncooked preferably. Possibly the best baits to use are small crabs split open and tied on the hook with bait elastic. If they are too big then cut the crabs in half. Shellfish and crab are probably the best baits for elephant fish that will out-fish anything else. But I have caught elephantfish from time to time on yellow-eyed mullet, and even pre-frozen squid. A word of warning; toheroa is only allowed to be taken during a very limited season that is declared only about one day each year. We think this is also the egg capsule of an elephant fish but have not had this one confirmed. 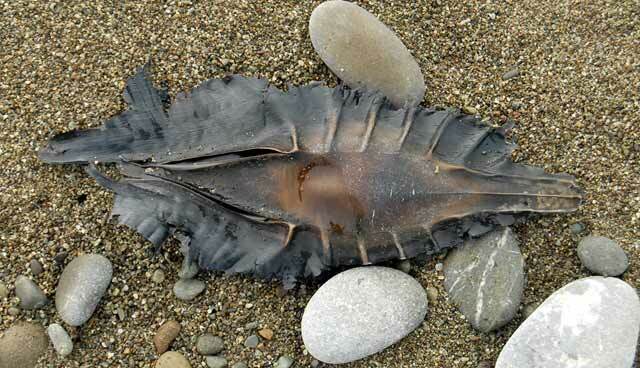 It was also found on the beach at South Rangitata, a well-known elephant fish spawning ground. Photograph; Allan Burgess. The best time of year to fish for elephant fish in Canterbury seems to be during December and January. However, I have caught elephant fish on the South Island’s West Coast on several occasions during mid-winter. Unlike bony fish, elephant fish are like sharks having no bones; their skeleton is made of cartilage, which although tough and fibrous, it is not as hard as bone. This means you get a considerable amount of firm fish fillets from an elephant fish. 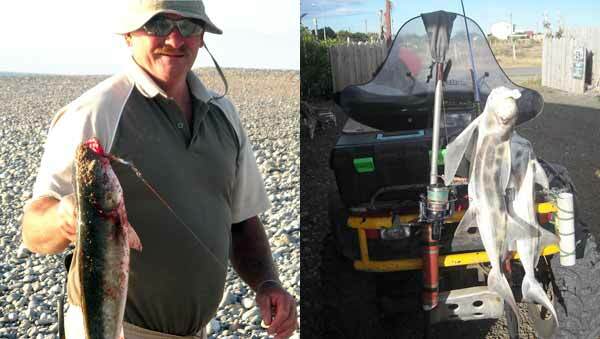 Elephant fish caught surfcasting at South Rakaia Huts. Steel traces are required as the elephant fish has powerful crushing teeth that will soon cut through monofilament. Big hooks aren’t necessary. A size 2/0 being quite a sufficient hook size. Traces can also be tied from heavy monofilament (37kg or 80lb). The beach at Spencer Park just to the south of the mouth of the Waimakariri River seems to be a very good spot for surfcasting for elephant fish. They are also caught from the beaches of the Canterbury Bight from Birdlings Flat down to the Rangitata River. I’m sure they move about in schools as many experienced surfcasters report that when they have caught elephant fish they sometimes get quite a few at the same time. 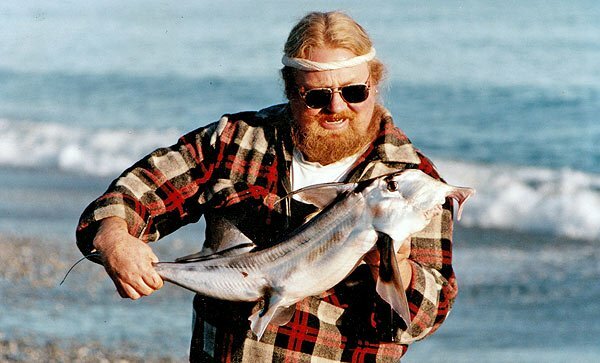 A mate of mine who has a bach on the south side of the Rangitata River mouth tells me that some evenings 20 or more elephant fish have been caught by him and his mates surfcasting across the road. I suspect they are moving around in sizeable schools. Elephant fish are by no means confined to Canterbury. 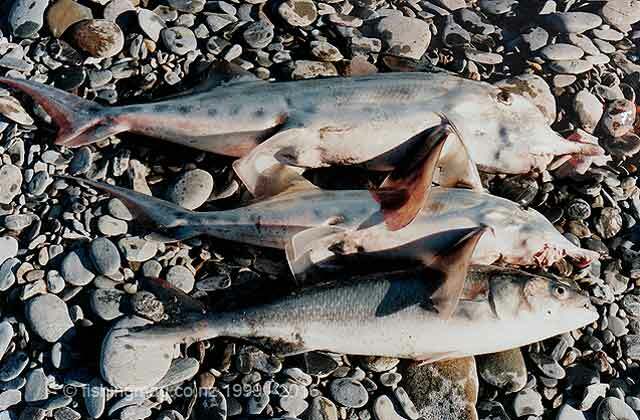 I have caught them on the West Coast of the South Island as far south as Haast. Elephant fish are strong hard fighters even when hooked on heavy, surfcasting tackle. They swim strongly up and down the beach when hooked. 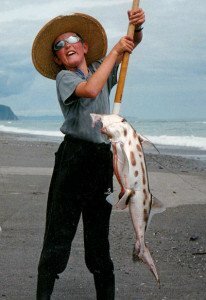 Elephant fish and kahawai caught surfcasting near Haast, Westland. 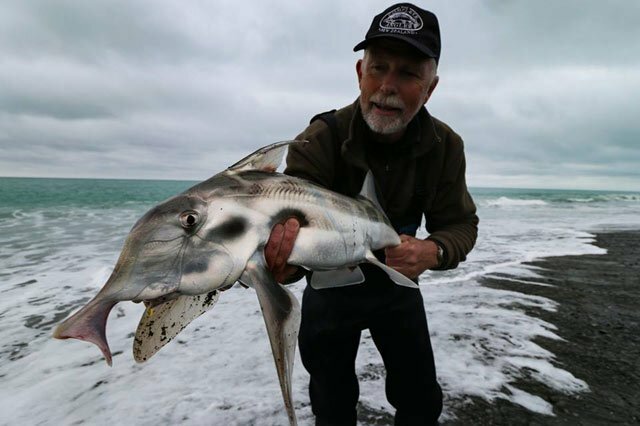 This elephant fish was taken surfcasting near Haast, on the South Island’s West Coast. Elephant fish taken on crayfish legs or crab surfcasting at Birdlings Flat. 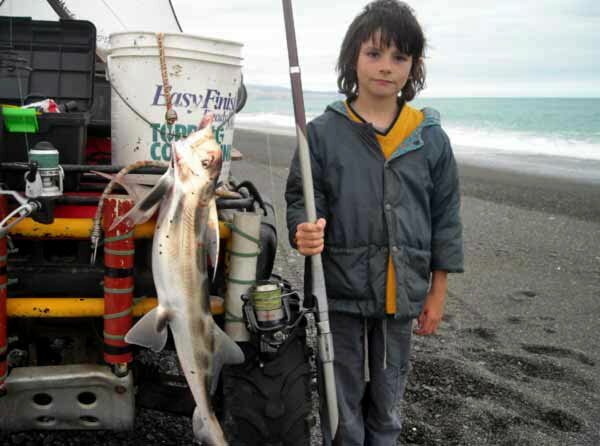 Ian’s son Marlin Robertson, 7 years old, with his first elephant fish caught at Birdlings Flat/Bayleys Beach on 11 January 2011 at 5.30 pm on cooked prawn bait. Elephant fish taken surfcasting at Birdlings Flat. Kahawai caught at Birdlings Flat and a couple of strong fighting elephant fish. Many thanks to Ian for sharing his excellent surfcasting photographs. The elephantfish uses its trunk, or snout, to detect crustaceans, molluscs and small fishes hiding in the bottom sediment. This species are good fighters when hooked on rod and line. The flesh is often sold as silver trumpeter. The secret to catching elephant fish is not only knowing where to go but also what bait to use. The elephant fish (Callerhinchus milii) along with the ghost sharks and spook fish belong to a group of fish known as chimaeras. Like the sharks, skates, and rays, the chimaeras are cartilaginous fish, that is, they lack bony skeletons. The elephant fish can be immediately recognised by the unusual trunk-like snout which it apparently uses to detect its prey on the soft sandy sea floor. Other obvious features are a smooth skin, a high first dorsal fin with a large spine on the leading edge, an elongated upper lobe on the tail and a small gill opening on each side, just ahead of the paddle-like pectoral ﬁns. An elephant fish fresh from the sea is an amazing sight. Colouration is an intense silvery white with brown blotches on the sides. The ﬁns share this colourful display and also appear to be almost translucent. The elephant fish preys on shellfish and crustaceans; these are crushed in the very powerful jaws between plate-like teeth in both jaws. There is an additional pair of tooth plates in the upper jaw. Elephant fish prefer cool temperate waters and are found more commonly in the waters surrounding the South Island. They are known to venture into waters as deep as 100 fathoms. During spring and early summer, adult elephant fish tend to move inshore where they mate. Reproduction is oviparous; each fertilised egg is contained within a light brown spindle-shaped capsule which is laid on the seafloor. Some six to eight months later, the egg hatches and a young elephant fish emerges from the capsule. The young fish grows slowly with maturity being reached after five years. The elephant fish grows to a maximum length of around 1.2 meters and is reported to weigh up to 9 kg. 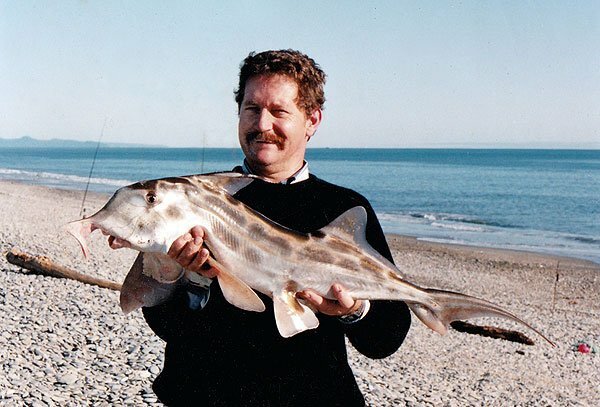 The largest specimen that I have seen was caught by Allan Burgess at Haast in June of 1994. This magnificent catch weighed 6.8kg (15 lbs). The elephant fish is a prized catch, particularly by surf casters who fish the gutters on open surf beaches. The most preferred bait appears to be molluscs, either squid, octopus or bivalve shellfish such as tuatuas. When surf fishing with tuatuas, it is advisable to bind the bait with cotton so that it will not fly off the hook when you cast. A ledger rig with chemically sharpened 4/0 Gamakatsu Octopus hooks is an ideal set up. 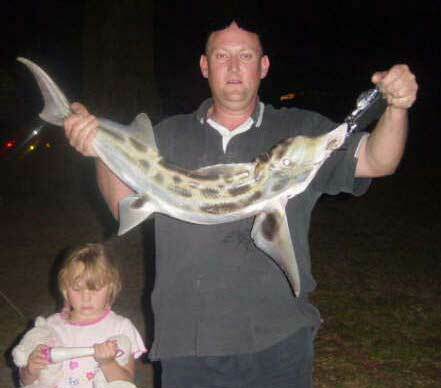 Some anglers prefer to use alight steel trace when fishing for elephant fish although I am sure that this is primarily because of the school sharks that also frequent the beach gutters. The powerful jaws of the elephant fish make short work of large tuatuas so I am sure they also have the capability of grinding through light monofilament nylon traces. 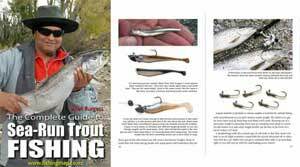 You have probably read in some articles in fishing magazines and books that elephant fish rarely take a baited hook. If so, someone forgot to tell the four elephant fish that Allan Burgess caught at Haast on one day. Allan Burges with a 6.8kg (15 lbs) elephantfish caught surfcasting near Haast, Westland. Elephant fish put up an impressive fight when caught on light tackle. A lot of the ﬁghting power comes from the use of the large pectoral ﬁns. 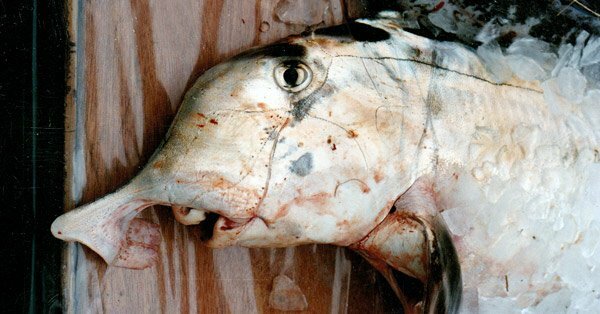 The eating qualities of elephant ﬁsh are particularly popular with the ﬁsh and chip trade. The ﬂesh is ﬁrm, tasty, and has a high protein content. In order to get the best quality out of the ﬂesh, it is important to fillet your ﬁsh as soon as possible after capture. I immediately put the ﬁllets into plastic bags and place them into a chili bin of ice. Elephant fish are usually taken in set nets and trawls, with the total commercial catch in New Zealand waters being around 1000 tonnes. Callorhinchus milii is also found in South Australian waters. Have you caught an elephant fish? We would love to add your photograph to this page. Please up-load it to us here with the uploader at the bottom of the page. You’ll need to log in with Facebook first here. Don’t forget to add a caption. If you prefer you can also post the picture to our Fishingmag.co.nz Facebook Page and we’ll add it here – either way, we would greatly appreciate more fishy pictures. The same applies to any of the articles you see in this site.